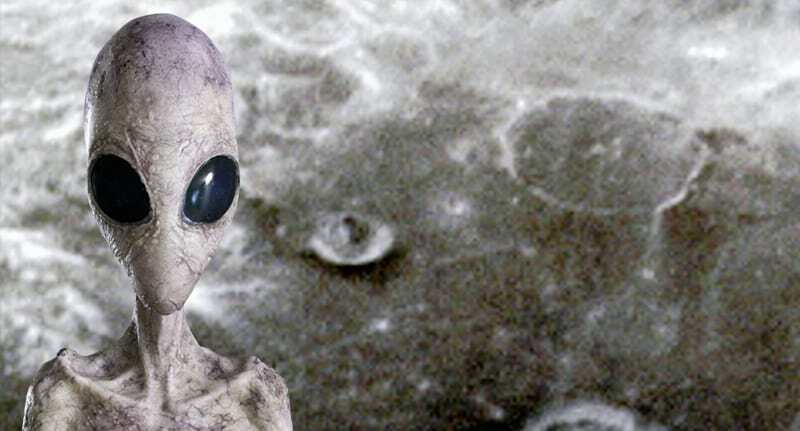 Truth-seekers believe they have found evidence of extra-terrestrial activity on the moon. YouTube UFOlogists, SecureTeam10 recently shared a photograph which they allege captures a ‘craft caught flying above the moon during one of the Apollo moon missions’. SecureTeam10 member Tyler narrates the lengthy video explanation, describing this unidentified object suspended by the moon as having a ‘smoke stack‘. While this type of ‘evidence’ of alien activity is ten a penny on YouTube, one hawk-eyed viewer spotted an almost identical object pictured in another older photograph taken of the moon’s surface. Keenly narrating this so-called proof that flying saucers exist, Tyler mused that these two sighting of what he claims are the same object imply the object has the power of flight. Thus, the truth-seekers at SecureTeam10 has jumped to the conclusion this object is, undoubtedly, an alien spaceship. Tyler goes onto explain that the above image of the moon is a regular occurrence in alien investigations of the moon, with some UFOlogists claiming it’s a satellite dish, a piece of a nuclear power station or even an alien installation. Tyler claims all the evidence means ‘you will have to come to the conclusion that we were not alone when we went to the moon’. He also goes onto point out differences between moon photographs taken during the Apollo mission and more contemporary lunar reconnaissance missions.